Pary Moppins: Happy Hot Buttered Rum Day! Happy Hot Buttered Rum Day! * I was sent tea by Pure Leaf and Influenster for sampling purposes. All opinions and rebellious tendencies are my own. Did you know that January 17th was National Hot Buttered Rum Day? All of the folks up north with their snow shoveling and skiing and other cold weather activities might really appreciate a warm cup of cheer about now. But here in Houston, it is a humid 77F outside which isn't that conducive to the hot dreamy creamy concoction; however, I have never been one to strictly adhere to convention. Nor have I ever been one to strictly follow a recipe...I'm seeing a pattern here...perhaps I have a problem with authority. I digress. This past holiday season, I recently discovered the delectable goodness of hot buttered rum. What I never realized before then was that it is made with hot water and not by heating the whole drink. It seemed like I was missing a trick there. Then it came to me - why not add one extra layer of flavor by making the libation with tea?! And Hot Buttered Rum Tea was the result. 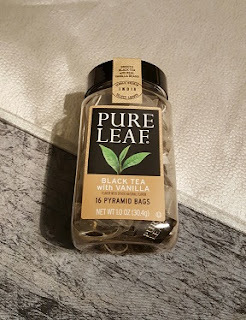 Pure Leaf black tea with vanilla is perfect for this recipe because it infuses a depth of flavor. If you or someone you're serving is tea-total or even more importantly, a designated driver, then simply leave out the rum and no one is left out of the deliciousness! Cream brown sugar and butter in a mixer. Pour in cream, powdered sugar, and spices. Mix until whipped and totally incorporated. Spoon mixture into a container and put in the fridge until ready to use. Make a mug of tea by steeping the Pure Leaf teabag in 6oz. boiling water for 3 or 4 minutes. Remove the teabag and put 2 Tbs. of the butter mixture and a shot of rum in the mug. Serve with a cinnamon stick or some freshly grated nutmeg over the top. *I prefer to use dark rum or spiced rum here but white rum is also good.